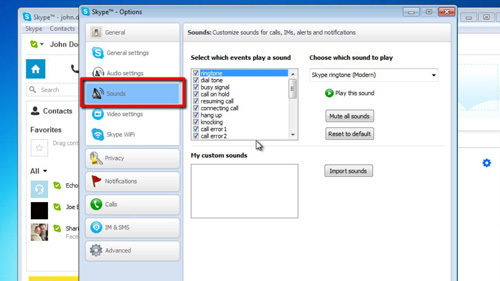 In this tutorial you are going to learn how to turn Skype sounds off. Open Skype and sign in to your account. From the “Skype” menu item in the main menu navigate to “Profile” then to “Change Sounds…”. 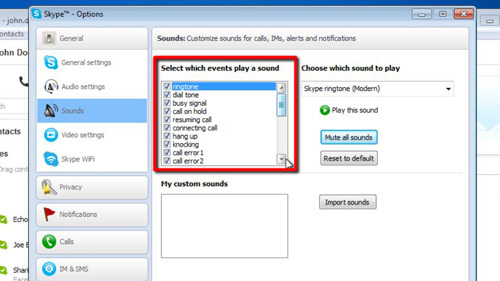 This will open a window titled: “Skype – Options”, and the “Sounds” tab on the left will be highlighted. Step # 2 – Mute all Sounds. Click on the gray button that says “Mute all Sounds”, found on the right hand half of the window. This will turn off all of your sounds. After you click this button, it changes to “Enable all sounds” allowing you to easily toggle the sounds on and off, just by repeatedly clicking the button. Alternatively, pick and choose individual event sounds to turn off by deselecting their checkboxes in the list found under the “Select which events play a sound” title. In this example we are going to choose to mute “call error 2”. 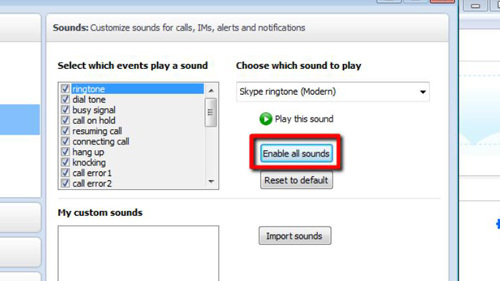 Confirm your choice by clicking on the “Save” button found at the bottom of the options window and this is how to turn Skype sounds off.